When a stream of light passes through the sky, it casted out a psychedelic display of light and shadow on stage. 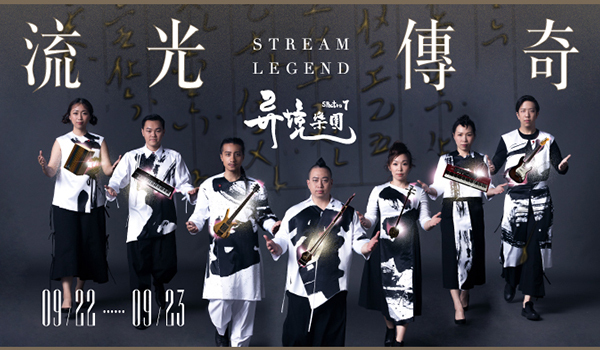 Stream Legend is led by cross-border musician 吳政君 using traditional instruments “Banhu fiddle”, “Zhongruan”and “three string fiddle”, fuse with elements such as Hakka, Latin and jazz. By combining with the four musical instruments of Nanguan music,《Awaited Homecoming》tells of the homesickness across time and space and is played in pop music,《Moonlight》 is a Hakka nursery rhymes supplemented by《Moonlight Mambo》, a Latin Mambo that could drive audiences to dance along in ecstacy and feel deeply touched by the music. Traditional Eastern music are fuse with elements from modern pop, latin, jazz, hakka, etc to present a legendary musical sound showing the beauty of traditional Chinese Opera and also displaying to the public the spirit and culture of the locals. The performer's costume is designed by the renowned designer Justin Chou who uses calligraphy elements from calligraphic master “TongYang-Tze” and fully gives out an exquisite aesthetics design under lighting and shadow effects. Break the silence, play interactively and experience traditional music up close. An interactive dialogue between musical instruments led by Suona horn are like armies with thousands of men and horses roaming through the wilderness. Sailing to unknown circumstances in a tune full of mystique. Tells the helplessness of literati expelled to remote borderland in the old days and their depression from unfulfilled ambitions. Adapted from the traditional Hakka drama which is interesting in content. Different kinds of rhythms and harmonies are adapted bringing a total renewal to this piece of music. A Heng Chun Folksong in recollecting of the past. This piece of music use the beat of traditional gongs and drums to show the passion of ancestors in defending of their homeland. Tells the legendary story about the battlefield and the family background of Zhao Kuangyin, known as Emperor Song Taizu. Traditional opera of Beiguang music are integrated into this performance . Tells of home sickness across time and space. A song that everyone could sing in a dream has been given a brand new presentation. Sing it gently, lively and with no pressure. An interesting interaction with the audience on how to sing the “gongchepu”, a traditional Chinese musical notation. Interaction has never been this much fun. The Hakka nursery rhymes “Moonlight”is supplemented by the rhythm of Latin music “Mambo”and played by improvised musicians, you will want to dance to the music. An adaptation of Hakka's three character tea-picking Opera. The rhythm of western classical music is mixed with Latin rhythm bringing out more passion than before. This music piece connects the five elements, which represent the personality and style of each ethnic group, into series with the use of ancient tunes and opens up the first chapter of the world of five elements.